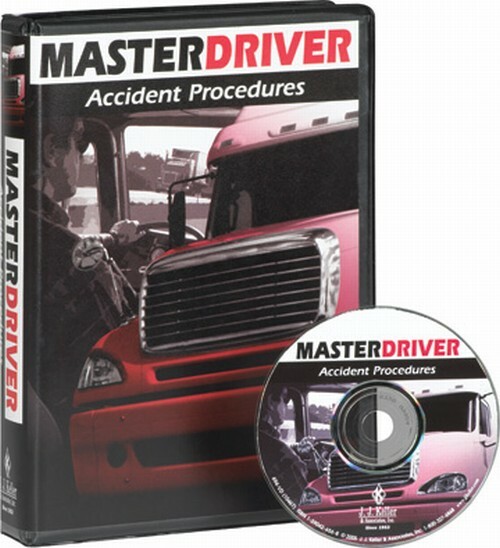 Accident Procedures DVD Master Driver Training Program Video Series 912-DVD provides suggested step-by-step procedures of what must be done in the event of a crash. It also reminds drivers that their actions and accurate reporting can prevent further injuries or damages, as well as protect drivers and their companies from liability. Not only is accident procedure training vitally important, it's required by law. It's also training that all drivers hope they never have to use but need to be able to instantly recall in the event of a crash. This program covers a critical safety topic in less than 17 minutes and keeps your drivers' attention with dramatic footage, dynamic graphics, 3-D animation, hazard perception challenge scenarios, and "Road Wise" commentary from seasoned transport pros. Hazard Perception Challenge – The video opens with an accident scene scenario. Introduction – Explains that there are seven steps every CMV driver needs to take following an accident or crash. Step 1 – Stop immediately if you're either involved in the incident, or are the first on the scene. Step 2 – Set out warning devices so approaching motorists use caution. Reviews proper placement. Step 3 – Help the injured by providing reasonable assistance. Step 4 – Contact law enforcement and let them know exactly where the crash took place. Step 5 – Document the incident while the events are still clear in your head. Reviews guidelines on what to do and what not to do. Step 6 – Contact your company and follow their instructions. Step 7 – Complete your accident report. Conclusion – Emphasizes that you need to know all the steps to take following a crash, know what you're required to do by law, and to act quickly and professionally. Hazard Perception Challenge Answer – The video closes with an accident scene scenario. Checklist – Increases understanding and retention. (1) 17-minute, closed-captioned video - Available on DVD (with extra bonus features), the program combines engaging video and editing technology with expertise from industry professionals at all levels.